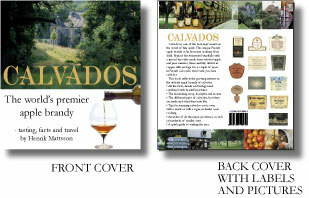 Calvados - guide to the region and the apple brandy, Normandy, France. Home All about calvados History Classifications Production Producers Visiting Normandy Links Recipes Drinks Sitemap Buy a signed copy directly from the publisher Flavourrider. Only 40 Euros including worldwide shipping. Welcome to my calvados site! Finally - one of the best kept secrets in the world of fine spirits - is revealed in "Calvados - the world's premier apple brandy". The book reflects the increasing interest around the world. Have a preview at the Calvadosbook at Google Books. Now available on Ipad - only $19.99! The book is available directly from this site, for Kindle at Amazon.com, or as Ibook for Ipad on Itunes. On this site you can pay secure by credit card on Paypal and I'll send you a signed copy a.s.a.p. Worldwide delivery is included in the price. Calvados is carefully distilled in Normandy from dry cider made from special apple varieties, aged in French Oak barrels then blended and bottled for the connoisseur. The book is a first in comprehensive reporting in English on the facts, the history, the myths and secrets, as well as how to taste, judge and enjoy this unique spirit. A phone and address directory of the producers, both large and small, tasting notes, food and cigar pairing, recipes and a gastronomic tour guide are included. "Your book Calvados is magnificient - and I speak as an eau-de-vie enthusiast since the Liberation of Normandy in World War II! Accurate, beautifully written, informative and very attractive..."
Hugo Dunn-Meynell, writer and former chairman of the International Wine and Food Society. "I received your parcel. Thanks a lot for this book, it is very well documented and certainly a unique reference on the subject in english." Paying with credit card with Paypal is safe! Read more about PayPal and buying safely. With PayPal you can pay secure with your creditcard in any currency and from all over the world. Your creditcard information are safe with PayPal and not sent to the seller. PayPal protects your online purchase. The book about Calvados was the winner of the Gourmand World Cookbook Awards 2004, in the category - "Best Wine Book - France" and "Best Spirits and other Drinks Books - Rest of the world". It also got an "honorable mention".